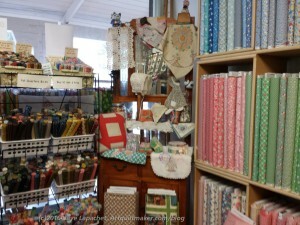 The next quilt shop I visited was also in Paradise. 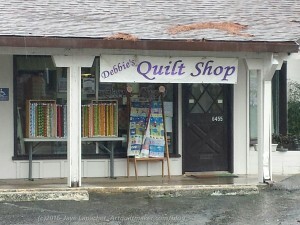 It was called Debbie’s Quilt Shop and it was around the corner from Morning Star Quilts. The Morning Star Quilt ladies encouraged me to visit. This shop had a very traditional bent to it. In addition to the Civil War type repros, I saw a nice selection of 30s fabrics. They had just gotten some fabrics that looked very mid-century modern. The lady helping me was trying to find a pattern with which to use them. The shop was not really my style, but there was a healthy selection of solids and brights as well, so I found a few things to pick up. The shop was small, but well stocked with every thing needed for a variety of projects. There were a fair number of BOM offerings as well as patterns, books and samples from both. They had a number of paper piecing patterns, classes. Their strength was the lady helping me. She was very friendly and not in an obnoxious way. She said that she and the owner of Morning Star work together to keep their inventory different. I would guess they do that so both can stay in business. I like it!